Introduction: Peroneal neuropathy is a known complication of surgery performed in the supine or lithotomy positions, or prolonged bedrest. Consequently, the American Academy of OR Nursing recommends placing a pillow behind the knee to prevent peroneal neuropathy. The purpose of this study was to investigate the effect of knee and ankle position on tension on, and pressure within the peroneal nerve at the fibular neck. Materials and Methods: The peroneal nerve of eight legs (paired legs from four cadavers) were exposed in the popliteal fossa 12 cm proximal to the fibular neck. The nerve was tied to a tension gauge using #2 silk suture at approximately 5kg force in the neutral position. Tension measurements were then taken at 0, 15, 30, 45, 60, 75, and 90 degrees knee flexion. Using portable ultrasound guidance a Stryker compartment pressure gauge was introduced into the nerve at the fibular neck and intra-neural pressure was measured at each of these knee angles. The knee was then locked at 15 degrees flexion and the same measurements were repeated with the ankle at 0, 15, 30, and 45 degrees of plantarflexion. 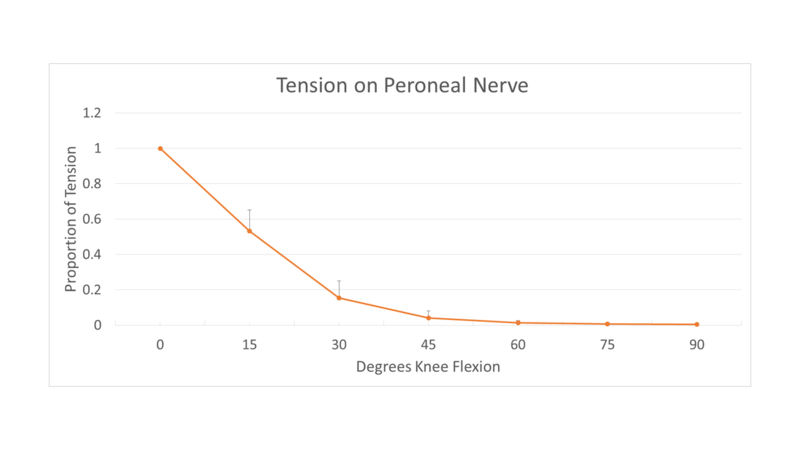 Results: The tension on the peroneal nerve decreased rapidly up to 30 degrees knee flexion then tapered off (Figure 1). The pressure within the nerve decreased in a similar pattern. Tension on the peroneal nerve increased with the ankle in 0 or 45 degrees plantarflexion and was least with the ankle at 15 or 30 degrees plantarflexion. Tension within the nerve did not vary with ankle position. Conclusions: Patients should be positioned with the knee in 30 or more degrees flexion when lying in the supine or lithotomy positions. Ankle position was not as important to tension or pressure within the nerve at the fibular head.